The Violin Sonatina is, like the Three Pieces, dated ‘Beare Green 1924’; it is dedicated ‘To Millicent’ (possibly Millicent Silver, who though later renowned as a harpsichordist began her career as a pianist and violinist). The diminutive generic title is perhaps hard to justify. This ambitious, virtuosic and formidably accomplished work is neither a ‘little’ nor a particularly ‘light’ sonata (perhaps the lack of a slow movement was felt to debar it from full sonata status). Overall the Sonatina traces a tonal course from B minor to B major. The spacious and sometimes ecstatic first movement begins with a peaceful, evocative melody, beautifully adapted to the prevailing 5/4 time, over a calmly undulating figure in the piano. A more skittish triplet motif forms a transition to a sonorous, grandly melodic second subject, first heard on piano and taken up by the violin against a bell-like ostinato in the pianist’s left hand. A passionate development section puts these ideas (and others that arise along the way) through some strenuous paces before the movement subsides to a serene close that recalls the opening theme. 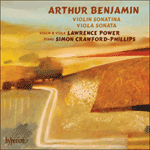 Benjamin entitled his E major middle movement Scherzo di stile antico, but there is little that immediately strikes the ear as archaic in this very rapid scherzo that skitters its way above a single nagging repeated bass note. Perhaps he was thinking of the more or less strict canonic imitations (an ‘antique’ discipline) between the violin and the piano’s right hand. The romantic tune of the trio section turns itself after a while into a suppressed waltz; the scherzo returns, deftly abbreviated. The finale is a good-natured rondo with a rather French-pastoral main tune. Very soon, however, the basic 3/4 time changes to 5/4 and the first movement’s opening idea is briefly heard; indeed the episodes of this rondo tend to reveal reminders of the first movement, often intermingled with the rondo theme as if through a mysterious osmosis. The movement drives towards its conclusion with increasing brilliance, rising at last to a cadenza-like outburst from the violin marked con summa forza ed ectasia (with fullest force and ecstasy) before the decisive final bars.